C2x, or check2xsf as it was first known, was developed in the TCM Group in Cambridge. It reads and writes a selection of file formats which relate to DFT electronic structure codes. It is not simply a conversion utility, but it can also perform manipulations and some analysis. It can form supercells and find primitive cells. If linked with the excellent spglib symmetry finder, it provides access to functionality from that package. It can interpolate densities via a combination of trilinear and Fourier interpolation, integrate densities and calculate their dipole moments, and analyse bands for inversion symmetry. Originally supporting just Castep, c2x now supports Abinit, Onetep, Quantum Espresso, Siesta and VASP as well. It thus can be considered to be a little like OpenBabel, but with an emphasis on different codes, and support for volumetric data. List of supported formats. One use of c2x is extracting volumetric data (charge density, colinear spin density, or charge density from a given band) for visualisation. It supports output formats compatible with XCrysDen, VESTA, VMD and Jmol amongst others, and can also produce 1D data in a format suitable for gnuplot. 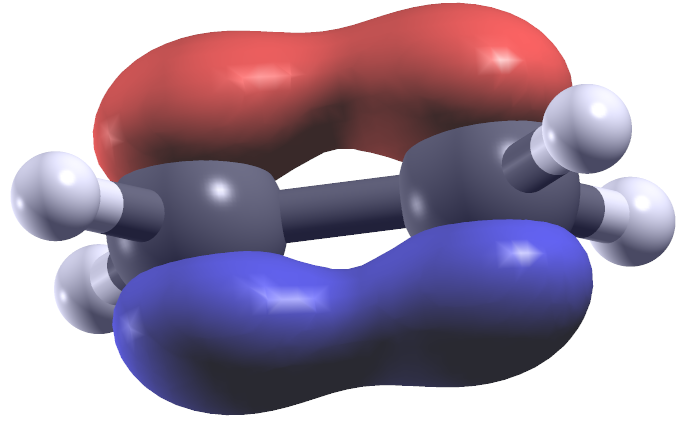 The ethene π bond above is from a recent (2016) version of XCrysDen. Another use of c2x is to use one package's post-processing tools with another's. It can, for instance, convert a Castep .check file into a .chgcar file readable by VASP post-processors. C2x can be downloaded from its downloads page, as source or MacOS or Linux binaries. Source code of 2.05b made public, 12th December 2017, thus keeping a promise that it would be released in 2017. If you find it useful in your published research, the traditional academic acknowledgement of a citation would be appreciated. C2x: a tool for visualisation and input preparation for Castep and other electronic structure codes, MJ Rutter, Computer Physics Communications, 225C 152-157 (2018). Once such papers are noticed, they are added to this list.